I have been keeping these to myself for too long, zero carb noodles and rice! 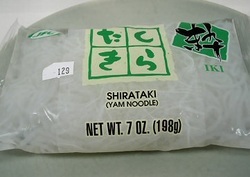 No, seriously the Shirataki based noodles and rice contain zero, yes zero active carbohydrates! These can be added to your zero carb meals to "flesh them out" like spaghetti to your beef stir fry (my personal favourite) or you can even make zero carb rice pudding! (yes I will reveal my recipes later). They come packed in water and require draining and rinsing with boiling water, after that they're ready to add to your meal. These can really save your life when dieting hard. The best part is, as they are made of dietary fibre - they will actually cost you energy to digest! So now you can eat your carb rich, filling meals without the guilt or the bloat.